Seated on a mat under the shade of a neem tree, Saiba, 11, tosses a red dice in the air and waits for it to land. She cringes when her token lands on a picture of a snake. She passes the dice to a friend next to her and waits for her turn. 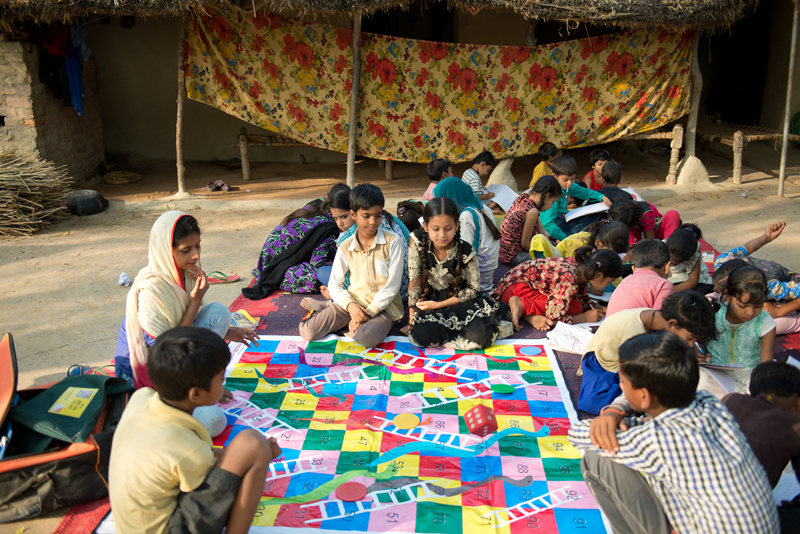 She is playing Snakes and Ladders board game with a bunch of her friends at Remedial Education Centre (REC). On other days they learn Hindi and Math. Saiba comes across as a timid girl but that is before the REC teacher, Niyazun, asks her to stand and lead the group in singing and other recreational-learning activities. She has the children’s rights on her finger tips and recites them like a prayer. “She could not read a sentence when she first came,” says Niyazun, smiling. While enrolling children to REC, more priorities are given to address the poor quality education of children in the community. Two baby goats sleep, resting their heads on children’s sandals outside the mat. A thatch-roofed house at the backdrop completes the rustic village set up. A dark green board in front is the only sign that draws resemblance to a classroom. REC is an innovative approach and community-led process that seeks to ensure learning support to children of age 6-11 years, in the community to inculcate basic knowledge about reading, writing, math and life skills. Every study centre has a teacher and free classes are given for two hours, five days a week. It is to ensure that children attain appropriate age learning and also develop foundational, essential and applied life skills. Children at REC are placed in three categories to make it easier for assessment and learning: level A (Classes 5 and above), level B (Classes 3 and 4) and level C (Classes 1 and 2). Teaching Learning Materials (TLMs) are developed by REC facilitators, aligned to the mainstream education. Exclusive monthly reviews and academic planning is done. Saiba is in the 5th standard and attends REC with one younger sister and younger brother. 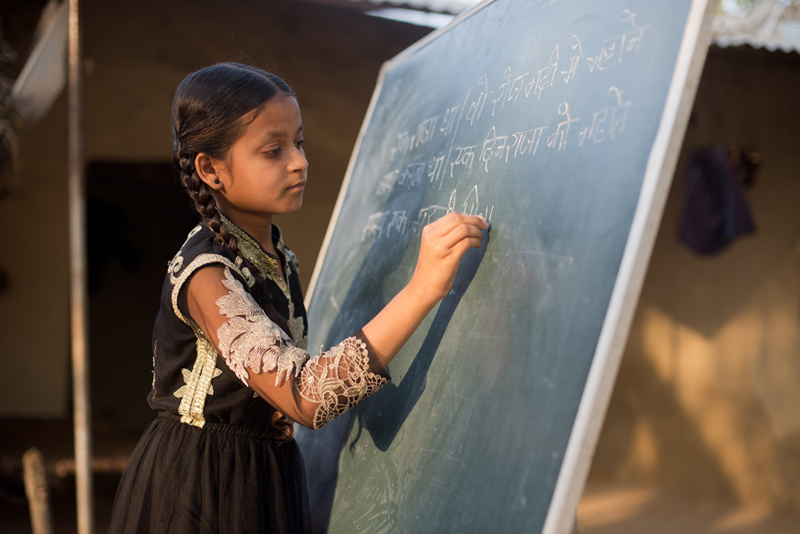 She struggled with Hindi and there was no one at home to help her with studies. Her parents were uneducated and have worked in farms all their lives. “We have no money to spend on education. Private class costs a lot of money, so we could not send our children to it even though we knew they needed it,” says Saiba’s mother Badima. All four of Badima’s children are in private school and she struggles to pay their fees. Saiba is also part of a Children’s Club set up by World Vision India. She has been trained in Life Skills Education and Transformation, a module for adolescents. Some of the subjects covered during the trainings are: safety, personal development, self-awareness, interpersonal relationship, management and stress, communication, creativity, critical thinking, decision making, emotional management, empathy problem solving etc. Children are empowered and more equipped to handle different situations in life. “At the Children’s Club, we also learned about personal hygiene and evils of child abuse and child marriage. We also learn to take care of trees and to keep our house and community clean,” says Saiba. In a block in Fatehpur District, World Vision India has set up 225 Remedial Education Centres in 31 villages covering 8226 households. At present 4800 poor performing children are enrolled in these centres and monitored every month to track their progress of reading and comprehension of local language and basic math. World Vision India has set up 1028 Remedial Education Centre across 4 states in India. “If the parents do not send the children to class, I visit them and ask them to send their children,” says Niyazun. Most parents in the community are farmers and are illiterate. Parental and community participation is important for successfully implementing REC. Parents are made aware of the importance of health, education and children’s well-being through many awareness programmes conducted by World Vision India. At home, Saiba likes to study on the rooftop, under the open sky. Rooms in her house are dim. Her younger brother, Ali, sits beside her. On a beautiful evening like this, she would have been playing outside with friends from the locality. But now, she can study on her own without anyone helping her and her dream of becoming a doctor does not seem that far off.